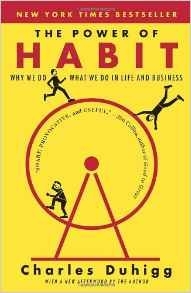 A useful book on improving your habits, but maybe a little over simplistic. Still useful if you want to get more control over your life, though. Certain habits, “keystone” habits, can bring many other good ones with them. E.g. exercising can make you eat better, sleep better. More than 40% of daily actions are out of habit. We learn and make decisions without any conscious engagement. When you find yourself doing something and ask “how did I get here?” it’s usually a habit. Habits are powerful, but can be changed if you know the formula for them. Every habit follows three steps: Cue – Routine – Reward. The cue starts the habit and is some form of stimuli, the routine is what you do in reaction to the cue and the reward is what you get from the routine, part of the reason you do it in the first place. You can’t ignore cues, but you can change the routine you do for a similar reward. E.g. if you’re bored and want something fun, you could try going for a walk instead of watching TV. To create a habit, find an obvious cue, and then define the reward you want. E.g. you’ll feel good if you go running, so create a cue of leaving out your running clothes by your bed so you see them immediately when you wake up. Then you’ll execute the running routine. Belief in the possibility of change is required in order for the change to happen. If you don’t believe you can change your habits, then you can’t. Creating small wins for your habits makes them easier to maintain. Grit is the largest predictor of success, the ability to push through and overcome obstacles. Willpower is not a skill, it’s a muscle, one you have to build and one that can become exhausted just like your arms or legs. If you can create a habit, then you don’t need to use willpower, and desirable activities become easier to do and you don’t use up the willpower you need for other things. There are 5 types of cues: Location, Time, Emotional state, People, and Immediately proceeding another action.